i think sometimes i forget how FREAKING BEAUTIFUL whole foods are. i mean, look at this plate?! it’s gorgeous right? and so simple, packed full of nutrition and flavor. beats the hell (no pun intended) out of some processed crap that comes out of a box (not sorry kraft). so let’s do this friends, let’s eat more meals that look like this and none meals that look like this. ok? good. i’m so glad we’re on the same page! – i used leftover quinoa but if you need to cook some, here’s a recipe! – in a small bowl combine grapeseed oil, red wine vinegar, honey and sea salt. – chop hazelnuts and spread on a baking sheet. roast in the oven with the beets for a few minutes- just long enough to bring out the flavor a bit and make the oven smell like roasted nuts! 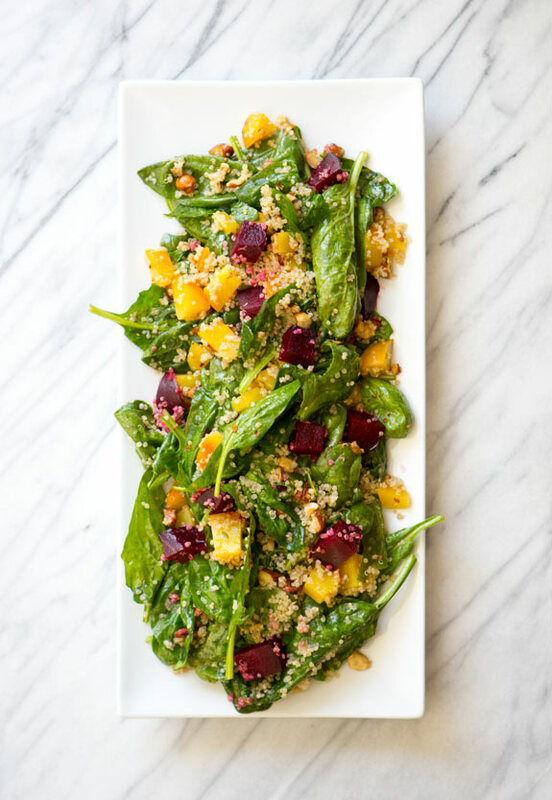 – in a large serving bowl combine spinach, quinoa (preferably cold), hazelnuts. – when beets are cooked, remove from oven and let cool. peel off skins and chop into 1″ pieces. – season with a extra bit of salt and cracked pepper. This looks amazing! I just started some quinoa so I can make it for lunch! I looooove your wooden + gold salad tossers! Where are they from, do share! thanks everyone!! @stephanie those are vintage, found on etsy! You are so right! 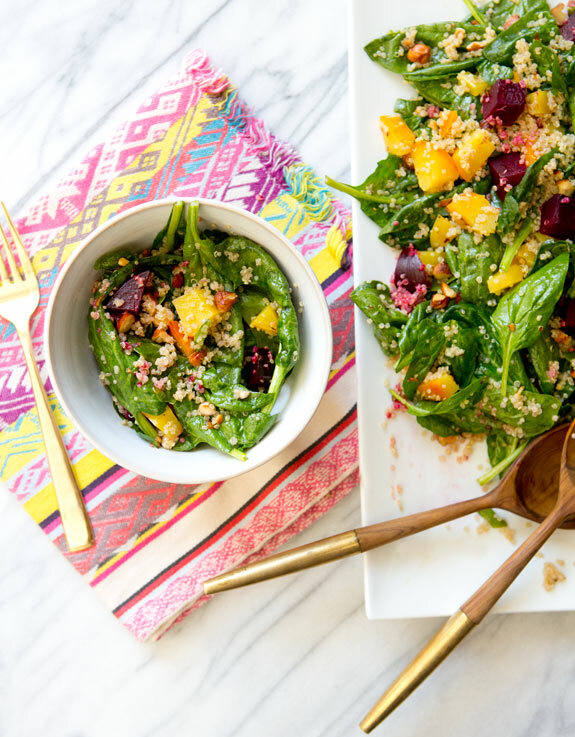 That salad looks absolutely delicious…and the fact that it is such a healthy one makes it look even better. I'm not a fan of beets, but gosh — it adds so much color!! Beautiful, adding this to my weekend to-do list! Where is the pretty cloth from? Wow Sarah, this is beautiful. 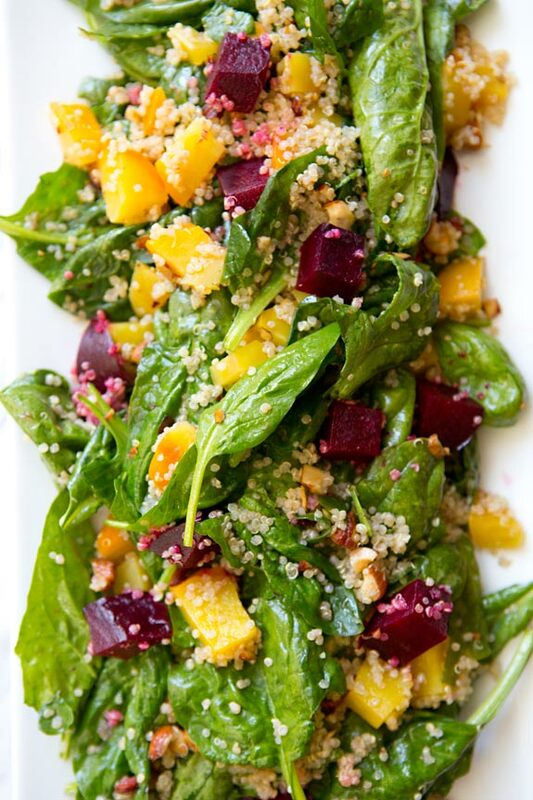 Beet salads are so wonderfully delicious. I love your tipped salad tongs too! Cheers! @erica the napkin is from anthropolgie (last year). still one of my favorites!! You photographed this beautifully! Love that napkin- where from?? Also, have you seen the Kraft boycott by Food Babe and 100 days of real food? The recipe does not include the yellow chunks ? What are they? yumm! top mine with some warm chevre and we have perfection! Gorgeous! Thanks for the colorful lunch inspiration! I made this today or lunch and it was so easy and delicious!! I used toasted pine nuts instead of the hazelnuts. You have to make this! !